To be an entrepreneur seems to be the buzz word now. We come across students as young as 13-14 with a dream to be a successful entrepreneur. Leading news papers almost on a daily basis publish reports of successful ventures and how people form top institutes are ditching cosy jobs and are turning entrepreneurs. On one side my heart fills with hope and pride for India but on the other side I am worried because if not given a proper direction and guidance these youngsters can never become entrepreneurs. A wise man had said "Entrepreneurship is living a few years of your life like most people won’t, so you can spend the rest of your life like most people can’t." There is no straight road that you can take to become an entrepreneur but yes there some ways in which you can try to fulfill this dream. 1. If you belong to a business family and business runs in your blood you can be an entrepreneur. If you join the existing business you are more of a business manager, it is only when you start a new business line / expand / find news markets etc that you become an entrepreneur. 2. There are some examples of people who started success full enterprises without much education like Dhirubhai Ambani but the numbers are less. 3. Today’s breed of entrepreneurs is different. A recent report by entrepreneurindia.com says that every year 200 IIM graduates take up entrepreneurship and 1600 IIT students annually turn entrepreneurs (Although IITs train students to become engineers and IIMs train them to manage businesses the environment of creativity and innovation that these Top institutes provide is perhaps the reason for such large number of new generation entrepreneurs with IIT or IIM background). So getting trained at some of these Top institutes in another way to become an entrepreneur. 4. Then there are some others who are actually professionals and end up being entrepreneurs like you are a trained chef and start a successful restaurant chain or you are a lawyer and start your own law firm. 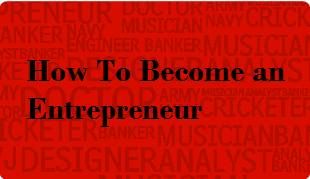 Like that you can take up professional course can become an entrepreneur. 1. Educate yourself (There are only handfuls that dropped out of school and made successful businesses the others are educated). 2. Have a business idea, if it is not an original idea no problem but it should solve an existing problem in a different way or could be a refined and better version of an existing business idea ( Think Google, face book). 3. Be skilled. You must have the aptitude, good communication skills, analytical skills and foresight to be successful. 4. Be connected. A strong network of people is the biggest asset that you can have. You can bounce of ideas and who knows you may raise money for your venture through the network. 5. Last but not the least. Be determined. Entrepreneurship is not for the weak hearted. You may initially face failures but if your idea clicks you are done.